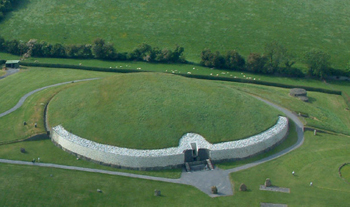 The best known monument within the Bru na Boinne complex is the impressive passage grave of Newgrange, famous for its winter solstice alignment. In 1962, excavation and restoration work on the tomb began under the supervision of Professor Michael J. O'Kelly and continued until 1975 when it was opened to the public. 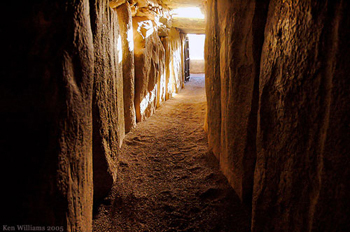 Newgrange is also famous for its many examples of megalithic rock art among which are many recognisable sun symbols. 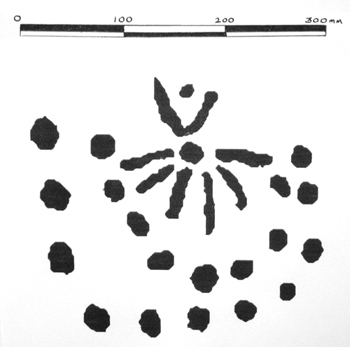 Thanks to Eve OKelly, daughter of Claire OKelly who made the original tracing, for permission to reproduce this drawing.